The worlds first continuous odor control system is one of the latest innovations by Technical Concepts. Utilizing a patented fluid delivery system, the TCell delivers a precise dose of pure designer fragrance and odor neutralizer for 60 days without the use of batteries. 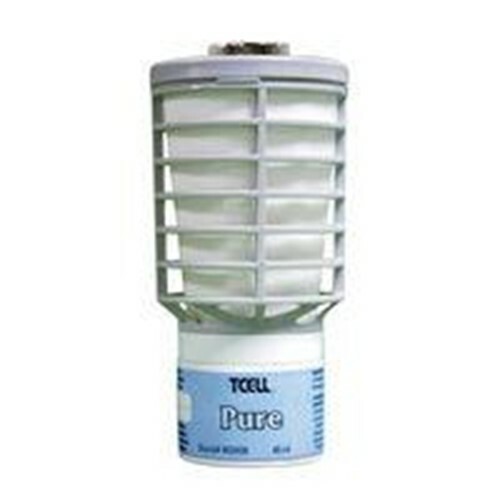 The TCell# odor control system dispenses a consistent level of fragrance. Up to 33% refill source reduction over traditional 30 day systems. Standard setting lasts 60 days for standard size washroom, 3 to 4 stalls. Light setting lasts 90 days for smaller size washroom, 1 to 2 stalls. No propellants or added VOCs.